There's a New Water in Town. Health Lab Vitamin Water. Bursting with mango and ylang ylang flavor, HEALTH LAB VISION is a true feast for the eyes. It’s packed with lutein, a carotenoid that improves eyesight and protects your eyes from harmful UV rays and blue light. Since you are looking at a screen as we speak, you see the need for it, right? ENG	Vitamin drink with raspberry and aloe vera flavor, added collagen. Ingredients: water, sugar, fructose, collagen hydrolysate, acidity regulators (citric acid, malic acid, trisodium citrate), flavourings, preservative (sodium benzoate), niacin, zinc sulphate, vitamin E, sodium selenate, biotin. FI Vitaminoitu vadelman ja aloeveran makuinen juoma, lisätty kollageenia. Ainesosat: vesi, sokeri, hedelmäsokeri, kollageenihydrolysaatti, happamuudensäätöaineet (sitruunahappo, omenahappo, trinatriumsitraatti), aromit, säilöntäaine (natriumbentsoaatti), niasiini, sinkkisulfaatti, E-vitamiini, natriumselenaatti, biotiini. Power, Balance & Skin & Beauty. What would you like today? The grapefruit and lemongrass flavored HEALTH LAB POWER gives you vim and vigor when you most need it. Boosted with zinc, vitamins B3, B5, B6 and B12 and magnesium, it wakes up your body and mind. With every sip you take. The orange and passion fruit flavored HEALTH LAB BALANCE contains all that is required to rev up your metabolism on a daily basis. The added biotin, zinc, vitamins B5 and B6 and magnesium help you stay amazing and maintain equilibrium when the going gets tough. Raspberry- and aloe vera-flavored HEALTH LAB SKIN & BEAUTY is like day spa in a bottle. Only better. With Collagen, zinc, selenium and vitamins E, B3 and B7 in every single sip, it pampers your skin, hair and nails from within. Hello gorgeous! ENG	Grapefruit and lemongrass flavored mineral water enriched with vitamins. Ingredients: water, sugar, fructose, acidity regulators (citric acid, malic acid), flavourings, magnesium citrate, preservative (sodium benzoate), calcium gluconate, calcium lactate, niacin, zinc sulphate, stabilizer (E445), pantothenic acid, vitamin B6, biotin, sodium selenate, vitamin B12, vitamin D.
FI Vitaminoitu greipin ja sitruunaruohon makuinen kivennäisvesipohjainen juoma. Ainesosat: vesi, sokeri, hedelmäsokeri, happamuudensäätöaineet (sitruunahappo, omenahappo), aromit, magnesiumsitraatti, säilöntäaine (natriumbentsoaatti), kalsiumglukonaatti, kalsiumlaktaatti, niasiini, sinkkisulfaatti, stabilointiaine (E445), pantoteenihappo, B6-vitamiini, biotiini, natriumselenaatti, B12-vitamiini, D-vitamiini. ENG	Orange and passion fruit flavored mineral water enriched with vitamins. Ingredients: water, sugar, fructose, acidity regulators (citric acid, malic acid), flavourings, potassium citrate, magnesium citrate, preservative (sodium benzoate), concentrate (lemon and safflower), zinc sulphate, stabilizer (E445), niacin, pantothenic acid, vitamin B6, folic acid, biotin, vitamin B12. FI Vitaminoitu appelsiinin ja passionhedelmän makuinen kivennäisvesipohjainen juoma. Ainesosat: vesi, sokeri, hedelmäsokeri, happamuudensäätöaineet (sitruunahappo, omenahappo), aromit, kaliumsitraatti, magnesiumsitraatti, säilöntäaine (natriumbentsoaatti), sitruuna- ja safloritiiviste, sinkkisulfaatti, stabilointiaine (E445), niasiini, pantoteenihappo, B6-vitamiini, foolihappo, biotiini, B12-vitamiini. We all know it: happiness is the new success. We believe that a joyful and balanced lifestyle starts with creativity and self-expression. What would you do, where would you go if there were absolutely no limits? A Drink to Believe In. Follow your bliss (and health). 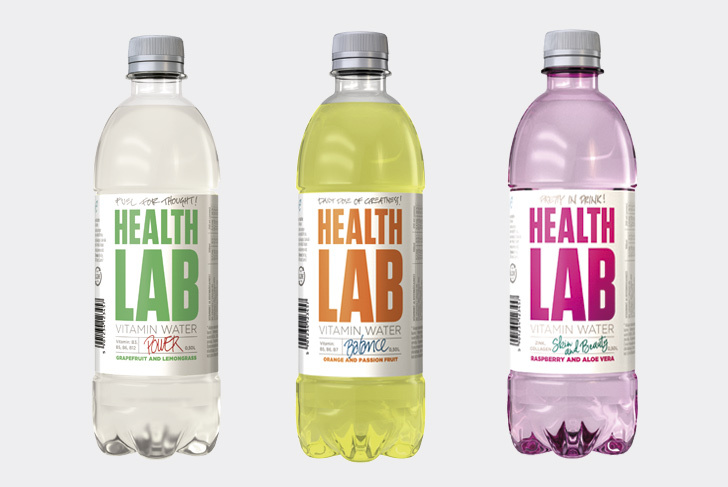 Whatever your dreams and aspirations may be, Health Lab Vitamin Water keeps you healthy and hydrated every step of the way. Boosted with vitamins, our water comes from natural sources in Finland. Elina Miettinen is a 32-year-old professional ballerina currently residing in New York City. Hailing from Helsinki, Finland, Elina moved to the U.S. at the age of 20 to work at the American Ballet Theatre. Nearly a decade later, she has found her place and home in the bustling city. "One of the best things about New York City is its unique vibe and energy. You just never get tired of it!" Elina says. In addition to pursuing her dream career in ballet dancing, Elina is looking forward to new exciting challenges and roles. Next she wants to try out acting. As the leading lady of Health Lab Vitamin Water, Elina encourages everyone to go after the things that make them tick. "In a hectic place like this, it can be really tough to find a good work life balance. But whenever I do what I love the most – get on stage and put my ballet shoes on – everything just makes perfect sense. My passion keeps me going." Discover our tips for a more joyous and well-balanced life on social media. Health Lab Vitamin Water is brought to you by Olvi.